Having the right pair of pants when you’re out on a hike can make all the difference. Whether you’re looking for something waterproof or convertible, the best women’s hiking pants will make your walk in the woods even better. We’ve researched the best-sellers and top brand to put together these hiking pants reviews. But, before we get started, let’s look at some of the features you need to know about when shopping. Waterproof: Waterproof pants keep out all the rain and water even offer some wind protection, too. Bear in mind, waterproof and water resistant aren’t the same. A lot of the pants that aren’t waterproof are in fact water resistant. Closure Type: There’s a variety here, from zips to snaps to buttons and which one is best is really personal preference! Also, most of these pants have some elastic around the waist to keep you comfortable while you’re on the go. 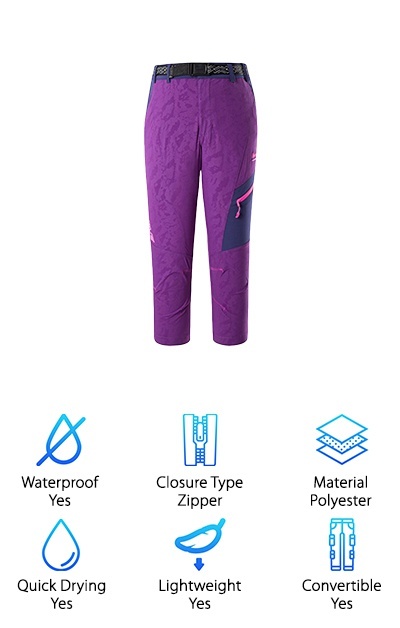 Material: These pants are either waterproof or water resistant and need to be lightweight, breathable, and somewhat stretchy. Because of this, they’re all made of nylon or polyester with and additional stretchy material like Spandex added in. Quick Drying: This is a great feature for hiking pants which is why all of our top picks have it. Quick drying pants to help water evaporate quicker. So, even if you do get wet, you won’t be for long. Lightweight: All of our picks are lightweight because that’s exactly what you want in a pair of hiking pants. They don’t inhibit our movement and let air flow through to keep you comfortable while working your way through the woods. Convertible: Some of these pants can easily be turned into shorts. How? By removing the lower legs at a zipper or rolling them up and securing them. We even found a pair with a drawstring, just pull up the legs and secure them. We’ve gone over the features you should look for in a pair of the best women’s hiking pants so now you know a little more about what to look for when you shop. Let’s get to our reviews. Here’s the deal: our top and budget picks are first. That’s a great place to look if you’re running short on time. Keep reading to learn more about the great products that round out our list. Ok, let’s go! There’s a lot to love about these ultralight hiking pants from Columbia. They’re made of nylon with a little bit of Elastane for stretch and durability. Plus, they have articulated knees. You’ll be able to climb and hike without feeling constricted because these pants move with you. That’s not all. If you’re out in the summer and you start getting too hot, they convert into a capri. Simply cuff them up and use the sewn in buttons and straps to hold them in place. They also have a security pocket that zips where you can safely keep any small, valuable items. They have an active fit with a straight leg and mid-rise. Get this: they come in short, regular, and long lengths, too, as well as 9 different colors to choose from. If you’re looking for cheap womens hiking pants, you’re going to be very happy with our budget pick. It’s probably not fair to call them “cheap” because they’re actually a pretty awesome pair of pants. The waist has a snap front but also has elastic on the sides so it will give a bit as you move. No worries about your waistband digging in and making you uncomfortable. They convert from pants to shorts that fall just above the knee. The convertible option is great for when you’re not sure how the weather is going to hold out. They’re water resistant and dry fast, too, so a little bit of water won’t ruin your hike. Oh, and there are 2 large cargo pockets. One more thing, they’re available in 8 different colors. We’re calling these the best hiking pants for summer. Why do we say that? Because not only are they convertible, but they don’t go from long pants to capris or knee length shorts. When you unzip the legs, they actually fall about 6 inches above the knee. Proper shorts but long enough to give you some protection. They’re also made of fabric that has some SPF in it so you’ll get some extra sun protection, too. And get this: they coated in Teflon fabric protector. You know what that means? They’re waterproof so go ahead and wade into the lake or stream to cool off! They have a button closure with elastic on the sides for extra comfort. And get this: they’re available in 5 different colors. 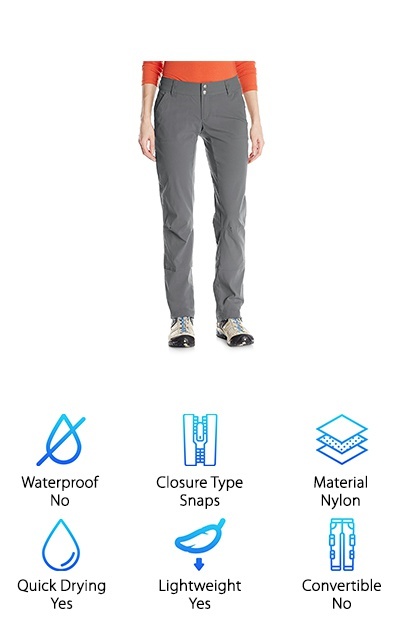 The Nonwe Hiking Pants are convertible, but in a different way than we’ve seen so far. Rather than zipping to lower legs on and off, they have a drawstring around the ankles. Simply pull up the legs as short as you want them, tighten the grips around your legs, and you’re ready. We really liked this because it was so fast and simple. Plus, there are no extra pieces of fabric to carry around like when you remove the lower legs altogether. The waist has elastic on each side of the waist for better movement and comfort. Another great thing is the lightweight, breathable fabric that really helps keep you cool on the trail. And they’re also water resistant and quick drying, too. As for washing them, it couldn’t be easier. Just throw them in the washing machine with cold water. 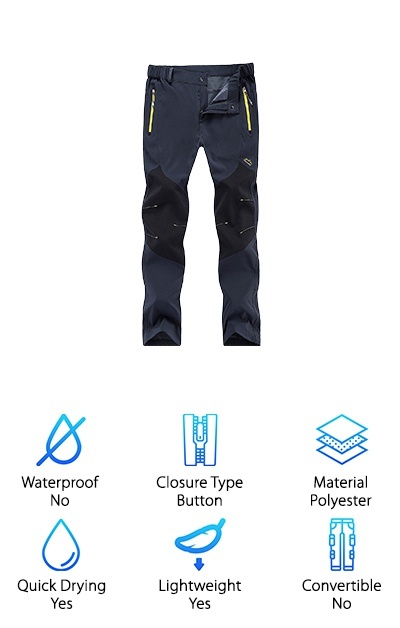 We think these SingBring Hiking Pants are the best waterproof pants for hiking. One of the things we like the most about them is the tough fabric that covers the knees and lower thighs. First of all, this is a great feature that will make your pants last even longer because the knees are the place most likely to get a tear. But we also loved having somewhere really handy where we could quickly wipe water or mud off of our fingers! The knees are articulated, too, so the extra fabric doesn’t inhibit movement. The waist is adjustable and has elastic size for more comfort and a better fit. Plus, there are 2 zippered front pockets that are the perfect place to put maps, cash, or anything else small and important that you don’t want to get wet. These are some of the best waterproof hiking pants we came across in our research. But there’s actually a lot more to these Diamond Candy Mountain Pants than that. Of course, it’s awesome that they are waterproof, but get this: they’re windproof, too! The fabric has a special coating and the seams are sealed, too, so no water or cold air is getting inside. Plus, the inner layer of the pants is made of polar fleece. It’s not enough to keep you warm for winter hikes but it is just enough to make them super soft and comfortable on the inside. The elastic waistband keeps them really comfortable as you move, too. They’re machine washable, which is great for a pair of pants that you’re going to want to wear outside all the time. They’re also available in 4 different colors. The Halle Pant from prAna is a pretty stylish looking pair of hiking pants. They have a relaxed fit, trouser cut, straight leg, and a mid-rise. The fabric is stretch Zion that that is not only water repellent but also wicks moisture away from your skin. If you sweat a lot, moisture wicking is a really awesome feature to have. They’re quick drying, too, so sweat and water evaporate quickly. It has a double button fly and articulates knees to help you stay comfy, too. Plus, there’s a hidden stash pocket on the upper right leg. They’re convertible, too. The bottoms roll up to a capri length and are held in place by interior straps that button around the fabric. They come in short, regular, and tall lengths, too, as well as 8 stylish colors. Here’s what we loved the most about these Jessie Kidden Hiking Pants: they’re coated in Teflon. Not even kidding, these things are water repellent and don’t absorb any spills, stains, or anything else that you might come in contact with outdoors. They’re the best hiking rain pants. But wait, there’s more. They also have SPF protection. They’re not only functional, they’re comfortable, too. The waist has comfortable elastic sides that stretch as you move. Plus, they’re convertible, just zip off the pant legs and you’ve got an instant pair of shorts. That’s not all. They’re lightweight, comfortable, and breathable, too. 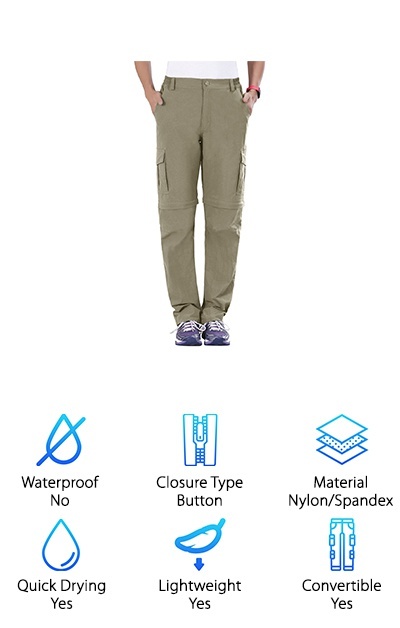 Not only are there 2 side front pockets, but there are also 2 roomy cargo pockets, too. They come in a nice range of sizes, too, from XS to XXL as well as 3 colors to choose from. 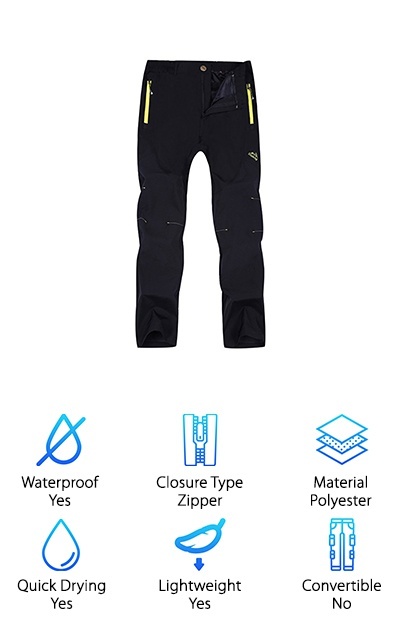 Huntvp has made a pair of hiking pants that are packed full of great features that make them super practical and comfortable at the same time. The waist has a button closure with elastic sides, but it also has an adjustable band so you’re sure to get a great fit. They’re designed to resemble military or law enforcement pants and have the same high-quality construction. There are side pockets that secure with a zipper closure and the fabric is water resistant and quick drying. That’s not all. These pants have reinforced knees that extend up the lower thigh. This really helps with their durability. Think about it. Your knees are the spot that’s most likely to tear or wear through. With the thick fabric reinforcement, they’ll get a little extra coverage and remain intact a little longer. 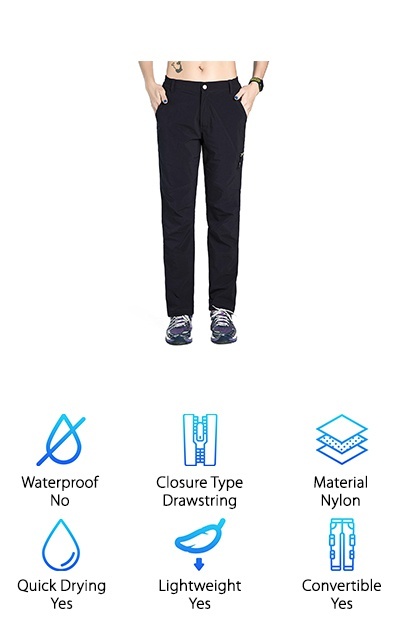 Makino’s Quick Dry Pants are more than quick dry. They’re waterproof, too, and they have UV protection right in the material of SPF 50. The fabric is mostly polyester but there’s also Spandex integrated to help give the fabric a nice 4-way stretch. They have a snap closure and elastic on the sides of the waistband, too. And, get this. For extra comfort and a better fit, you can actually increase and adjust the waistband a whole 4 inches. Plus, they’re easily convertible to shorts, just zip off the bottom and you have a short pair of cool capris. 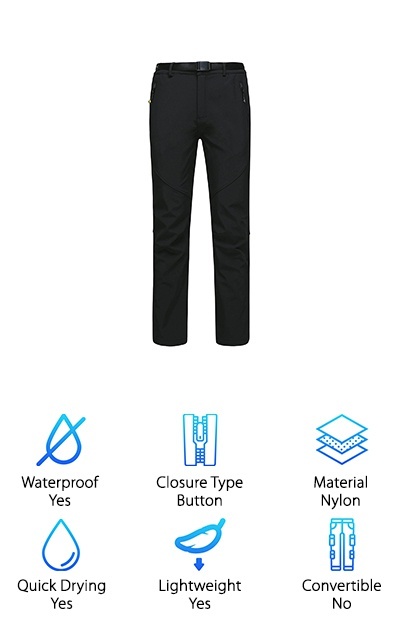 They’re a good looking and functional pair of pants that are available in 11 different colors and styles, too. And here’s the kicker. They offer a 30-day return and replace service and a 3-year limited manufacturer warranty.